With the full moon flooding the sky with light, it’s a good time to seek out spring’s double stars, shown here in yellow. Full Story. With the bright full moon lighting up the sky this week, it?s a goodtime to turn your telescope on objects unaffected by this natural ?lightpollution? ? twin-like double stars. A century ago, doublestars were a favorite target for amateur astronomers with small telescopes.Then, for some reason, they fell out of fashion. This is hard to fathom as theyare perfect objects for small telescopes to observe. Many double stars are very pretty to look at because of contrasts incolor and brightness, while some are beautiful because both components arealmost identical. Springtime offers some fine examples of all of these, and they arebright enough to be easily visible. Some are easy in any telescope, but someare a challenge. In this handy chart, the springtime double stars are shown in yellow,while other bright stars are shown in green. Let?s start with the most famous double star of all: Mizar, the middlestar in the handle of the Big Dipper, also known as the constellation UrsaMajor. This was well-known as a twinstar long before the invention of the telescope. Its companion star Alcorwas used as a vision test in ancient times. It?s not surprising that this wasone of the first stars that the newly invented telescope was pointed at, and itwas discovered that Mizar itself is a nice double: two stars of magnitude 2.3and 4.0 separated by 14 arcseconds. Distances in the sky are measured by the angles between them. A fullcircle contains 360 degrees, each of which is divided into 60 arcminutes, eachof which in turn is divided into 60 arcseconds. On this scale the sun and moon measure about 30 arcminutes in diameter,and the planet Jupiter is 45 arcseconds wide. The two stars in Mizar are separated by 14 arcseconds, about a third ofthe diameter of the planet Jupiter. Mars, at its largest a few months ago,would just fit between these two stars, as seen from Earth. Mizar is actually an optical quadruple star. The two components ofMizar itself are separated by 14 arcseconds. These in turn are separated by 709arcseconds (that's about 11.8 arcminutes) from Alcor. In between Mizar andAlcor, and a bit off to the side, is a fourth star with no name. Tucked just under the handle of Big Dipper is an obscure littleconstellation called Canes Venatici, the Hunting Dogs. This constellationis better known for its many galaxies than for its sparse stars. The one star that stands out is Cor Caroli, which is Latin for?Charles? Heart.? This refers to the two King Charles? of England: the onebefore and the other after the English Civil War (1641?1651). Cor Caroli, like the Mizar target, is a wide double star easily seenwith any telescope. Its two components, magnitudes 2.9 and 5.5, are verydifferent in brightness and separated by 19 arcseconds. Both Mizar and CorCaroli are easily split with an 80mm refractor at 30 power. The other three double stars of note are more of a challenge. Algieba, Gamma Leonis, is at the far left side of the ?backwardsquestion mark? that makes up on half of the constellation Leo. Its two stars,magnitudes 2.2 and 3.5, are only 4 arcseconds apart, half the current diameterof Mars. This star can also be split by an 80mm refractor, but you will needquite a bit of magnification, at least 100 power. Izar, also known as Epsilon Bo?tes, is just to the left of the brightspringtime star Arcturus. This star is doubly difficult because its stars arequite close, just under 3 arcseconds, and of very different brightness,magnitudes 2.4 and 4.9. 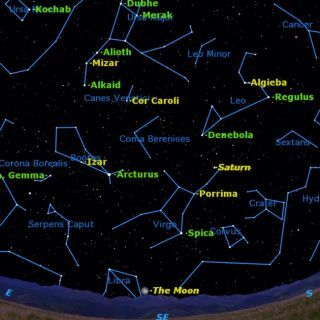 The final star, Porrima or Gamma Virginis, is just above the brightstar Spica and below the planet Saturn. ?Five years ago, the two components ofthis star were so close together, 0.35 arcseconds, that there wasn?t atelescope on Earth that could see them as double. This year, they are separated by 1.5 arcseconds, and are still achallenge in even quite a large telescope. The two stars are equally bright,both magnitude 3.5, and require at least a 250mm telescope and 200 power, aswell as steady atmospheric conditions. But the effort is worthwhile, when you spot these two tiny pinpoints oflight right next to each other. When you?re out with your telescope in the bright moonlight this week,be sure to check out the three bright planets currently in the sky: Venusin the west, Saturn in the southeast, and Mars high overhead.